It’s funny how a simple butter cookie can inspire such nostalgic memories. 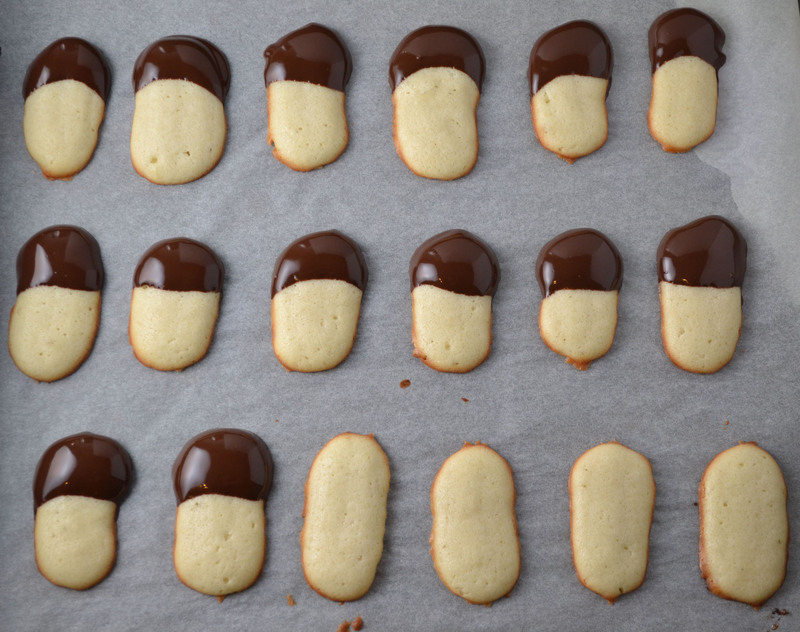 As a child, Cats’ Tongues or Langues du Chat was one of the first recipes I tried from “The Art of Fine Baking.” Although I enjoyed piping the buttery dough onto baking sheets, I didn’t really understand this plain cookie. Perhaps my taste buds were too accustomed to the corn syrup filled treats that were so readily available. Or maybe I just didn’t try these delicious little bites while they were still hot and fresh from the oven (by far the best time to eat them). Whatever the reason, it wasn’t until my father shared his memories of my grandmother making them that I really began to enjoy and appreciate this simple sweet treat. However, the addition of chocolate didn’t hurt either. Cats’ tongues cookies were the go-to cookie in Paula Peck’s kitchen. She would often make them for my father and uncle, who as children, eagerly watched as she piped the skinny pencil thin drops of dough onto a baking sheet. Fascinated with the pastry bag, my father often begged to try it and on the occasion that my grandmother relented, he promptly made a big mess of cookie dough and whatever baking sheet or other kitchen equipment/utensils it came in contact with. Once the cookies finally made it out of the oven, they were consumed by fist full. After whipping up a batch of these in under 30 minutes, I now see why they were a popular treat in my grandmother’s kitchen. Not only are they easy to make, it’s hard to stop eating them. This recipe is fairly large and can be easily halved but if you don’t finish them while fresh and hot, dip the cooled cookies in chocolate. 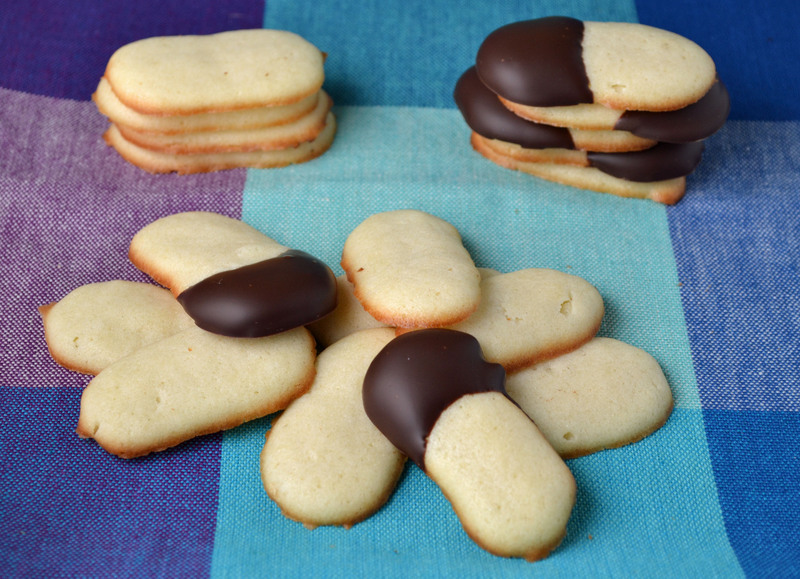 The chocolate adds a twist to the original plain cookie, making these buttery delights irresistible to all of us choco-holics. Preheat oven to 400 degrees. Grease and flour baking sheets or line with parchment paper. Cream butter and sugar. Beat in egg whites, a little at a time, beating well after each addition. Fold in flour, salt, and vanilla. Fit a pastry bag with a large star tube and fill bag with 2/3 of the cookie batter. On prepared baking sheets, pipe pencils of batter about 2 inches long. Leave one inch between cookies for spreading. Bake about 7 minutes or until edges of cookies are golden brown. Centers should remain light. Remove cookies from baking sheets at once. Once cool, dip in melted chocolate (if using).